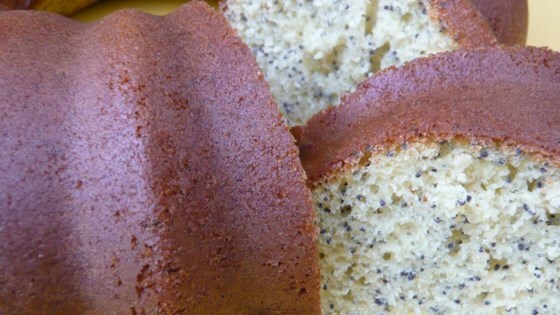 "This is my grandma's poppy seed cake. She's been making this cake for decades. It's easy, very moist, and has a very subtle flavor." Preheat an oven to 350 degrees F (175 degrees C). Grease and flour a 10 inch tube pan or Bundt pan. In a large bowl, beat together the eggs, water, whipped topping mix, yellow cake mix, and poppy seeds until light and fluffy, 3 to 4 minutes. Pour into the prepared pan. Bake in the preheated oven until a toothpick inserted into the center comes out clean, about 40 minutes. Cool in the pan for 10 minutes before removing to cool completely on a wire rack. Sprinkle with the confectioner's sugar. Flat and dense. Maybe I didn't beat it enough? It didn't specify the beater speed. I wouldn't make again.